Last week, my coworker laughed and told me I was a “sunscreen elitist” after my earnest reaction to her less-than-favorable description of some residents in a tiny, backwoods town was, “Oh man, I bet they don’t even use sunscreen!” I suppose it is a little funny, but in all seriousness, sunscreen is the most formidable weapon any of us can have in our anti-aging arsenal. Unfortunately, it can also be a little boring, so I like to spice it up whenever I can. The thing is, I go through sunscreen like water, so the expensive ones aren’t sustainable for me. 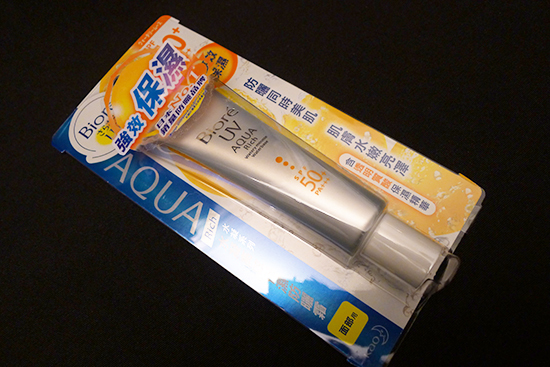 Instead, I opt to sample a variety of Asian sunscreens – Japanese ones are my favorite. Asian countries have been clued in to the value of daily UV protection for a very long time, and have managed to develop a wide variety of really pleasant, effective facial sunscreens. 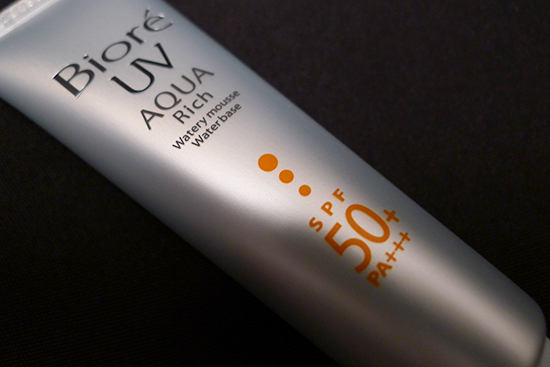 Biore UV Aqua Rich Watery Mousse SPF 50 / PA+++ is one of them. When I purchased Biore UV Aqua Rich Watery Mousse, I was already a fan of another sunscreen in the line, Biore UV Aqua Rich Watery Essence (which I reviewed here last summer). The Watery Mousse differs from the Watery Essence in that is more moisturizing, and therefore better suited for dry skin like mine. Biore UV Aqua Rich Watery Mousse is a Japanese sunscreen, that promises both UVB & UVA protection to the tune of SPF50 & PA+++ (the PA rating is it’s UVA protection score). In addition to UV protection, this product promises to prevent moisture loss, keep skin moist and “glossy,” and act as a makeup base, prolonging the wear of foundation. Ethylhexyl Methoxycinnamate – Also known as Octinoxate, this ingredient is a chemical sunscreen agent. Of the chemical sunscreen agents, this is one of the gentler ones. Chemical sunscreens work by absorbing and subsequently down UV rays. Additionally, after UV exposure, all chemical sunscreens generate some free radicals in the skin, a byproduct of the absorption and breakdown process. The antioxidant ingredients in this formula (and most chemical sunscreen formulas) help to counteract the free radical effect. 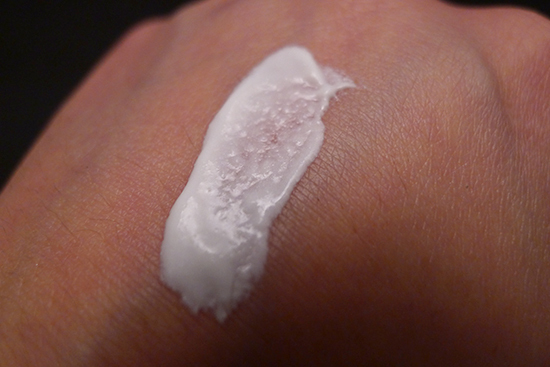 Titanium Dioxide – This is a physical/mineral sun protection ingredient. Instead of absorbing UV rays, mineral sunscreens actually deflect the rays away from the skin. Titanium Dioxide is a great sunscreen ingredient for those with sensitive skin – along with Zinc Oxide, it’s one of the most commonly used UV protectors in baby sunscreen. Ethylhexyl Dimethoxybenzylidene Dioxoimidazolidine Propionate – This is an interesting one – this chemical UVA filter is an ingredient that is currently exclusive to Japan. I didn’t know anything about it before I looked at the Watery Mousse ingredient list, and I’m sad to say – I still don’t know much about it. I was very unsuccessful at finding any details on this ingredient, so I don’t know much about its safety or efficacy. If anyone has more detailed information about Ethylhexyl Dimethoxybenzylidene Dioxoimidazolidine Propionate, I’d be grateful if you could share what you know! I really like that Biore UV Aqua Rich Watery Mousse contains both physical and chemical sunscreens. That’s my ideal in terms of UV protection. I only wish I knew more about the Ethylhexyl Dimethoxybenzylidene Dioxoimidazolidine Propionate ingredient. As far as moisturizing ingredients go, most of the moisturizing properties in this formula are coming from Benhyl Alcohol (a fatty alcohol), Dimethicone, Polyglyceryl-3 Polydimethylsiloxyethyl Dimethicone, and Ceratonia Siliqua Gum. According to COSDNA, Biore UV Aqua Rich Watery Mousse does contain a couple of red flags. One of them is alcohol, which scores a 3 out 5 as a potential irritant. There are two schools of though on alcohol and the skin – there are some who believe that alcohol in any amount and in any formula is harmful to the skin. Then there are those who believe that alcohol, when included in a well-formulated product, can actually be beneficial because it increases the absorption of other skincare actives. Based on the research available, which is best summed up in this FutureDerm article, I’m inclined to fall into the “alcohol can be good in a well-formulated product” camp. That said, there is a lot of alcohol in this product – it’s the fourth ingredient listed. The other ingredient COSDNA warns against is Potassium Hydroxide, which scores a 5 our of 5 as a potential irritant. This ingredient is extremely caustic if it should come in contact with the skin on its own. In this formula, however, it acts as a pH adjuster – because it’s balancing out a highly acid formula, it’s already been reacted, and is therefore no longer an irritant. 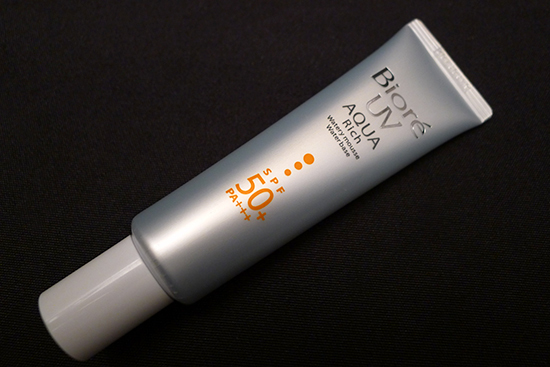 Biore UV Aqua Rich Watery Mousse comes packaged in a long, gray tube with a narrow dispenser. 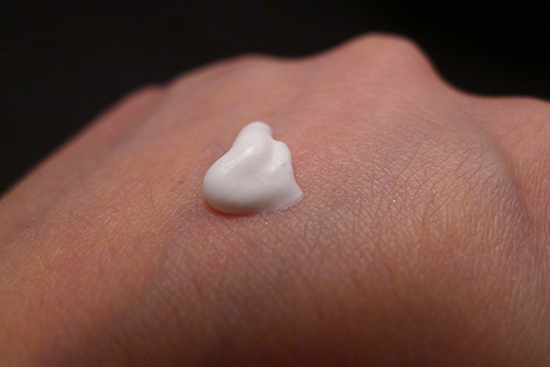 The sunscreen itself is completely white, and somewhat thick – significantly thicker than the Watery Essence. The Water Mousse stands on its own, so if you were to dispense it on the back of your hand and then tilt your hand, there would be no drips. Biore UV Aqua Rich Watery Mousse smells significantly less like alcohol than the Watery Essence. There is still a faint alcoholic quality to the fragrance though, alongside with a subtle citrus and barely-there, ambiguously floral scent. The smell isn’t very strong, and disappears upon application. A physical sunscreen works by deflecting UV rays away from the skin and does not need to be absorbed in order to work. For this reason, physical sunscreen works best when it is applied after moisturizer. With a product like Biore UV Aqua Rich Watery Mousse, we have both chemical and physical sun protection ingredients. There’s no official clinical stance on how to apply a product such as this one, as far as I know. I personally choose to apply it after my moisturizer, as the last step of my morning skincare routine. My reasoning is that applying this sunscreen under my skincare products will most certainly lessen the efficacy of the physical sunscreen component, while applying my chemical sunscreen last will not necessarily reduce the protection I get from it. I am careful to get an even application, and I always give it ample time to absorb appropriately – I wait about 10 minutes after my sunscreen application to start applying makeup. I wear 1/4 teaspoon (roughly 2 mL per square cm of skin) on my face daily, which seems like quite a bit, but this is the recommended amount to get the full SPF/PA protection listed for any sun protection product. I apply it in two 1/8 teaspoon “doses,” which makes rubbing in the necessary quantity of product significantly easier. I find Biore UV Aqua Rich Watery Mousse takes more effort to be completely absorbed than the Watery Essence, which is no surprise considering the mousse’s thicker texture and physical sunscreen ingredient. It’s still easier to rub in than a majority of the Western sunscreens I’ve tried, and once it’s been absorbed, it feels pretty light (though not as light as the Watery Essence). There is a slight white cast just after application as a result of the Titanium Dioxide, but it disappears within a matter of minutes. Biore UV Aqua Rich Watery Mousse has a lot of good qualities for someone with my skin type. My skin is dry enough that this sunscreen could never be a substitute for my moisturizer, but it’s certainly more moisturizing than the Watery Essence. I find this especially beneficial in the harsh, cold, dry winter weather we’ve been experiencing this season. I’ve been wearing it daily for just about 29 days now. I’m currently on my second tube, so if you wear sunscreen every day, and you are wearing the recommended 1/4 teaspoon amount, be prepared to purchase a couple of tubes a month. The sun protection aspect of the Watery Mousse seems to be very effective, though I still wish I knew more about the Ethylhexyl Dimethoxybenzylidene Dioxoimidazolidine Propionate. It’s easy to tell when you’re getting adequate UVB protection, since those are the rays responsible for both tanning and sunburn. UVA damage, however, is not immediately visible, and frankly, I find UVA to be much scarier since they are the rays responsible for premature aging and skin cancer. I try to take comfort in the fact that the one thing I know about Ethylhexyl Dimethoxybenzylidene Dioxoimidazolidine Propionate is that it is exclusively designed to protect against UVA rays. Biore UV Aqua Rich Watery Mousse has not caused any breakouts, and it is not oily or greasy at all. In terms of its purported qualities of a makeup base, it does actually seem to extend the wear of my BB cream or foundation by a couple of hours. Overall, I’m very happy with Biore UV Aqua Rich Watery Mousse. In spite of its few shortcomings, it shares a place with the Watery Essence as one of my most-reached-for sunscreens. I now have a decent supply of both the Watery Essence and the Watery Mousse. One does not replace the other for me; they each have their uses and I choose which one I wear depending on the weather and the way my skin feels that day. However, I wouldn’t label either of them my Holy Grail sunscreen because I have some minor ingredient misgivings about each of them. I’m still searching for my HG sunscreen, but until then, the Watery Mousse and the Watery Essence both come very close! Ingredients: 3/5 – I have some concerns about the citrus ingredients, and very little information about one of the primary UVA absorbers. Otherwise, it’s a decent formula with few irritants. Yes, Biore UV Aqua Rich Watery Mousse is worth the money, especially if you have dry skin. It retails for around $13, but be prepared to spend twice that amount in a month – wearing the recommended quantity of sunscreen means you’ll burn through a tube of this quite quickly. I initially bought my Biore UV Aqua Rich Watery Mousse from Sasa, but my second purchase came from eBay seller hot_jupitor36go. One tube is just under $13, but buying multiple tubes does get you a little discount. The products ship for free from Japan. This post contains affiliate links. Shopping these links helps support this site! Full disclosure. Oooh, Biore Watery Jelly is definitely on my list! Good to know it’s not sticky. And 90mls? I think that’s more than the Watery Mousse and the Watery Essence! What is the consistency like out of the bottle? Is it actually jelly like? I can definitely see the Mousse being too heavy for someone who doesn’t have dry skin. The Biore Watery Jelly is definitely going to be my next purchase. It sounds great. I have mixed feelings about the alcohol content of the Biore sunscreens – on the one hand, it does make me nervous, especially because there’s so much of it, but on the other hand – I feel the same way you do about the non-sticky finish. The alcohol is exactly what makes the Biore sunscreens so easy to wear! I might have to try this out once I finish my current tube and backup tube of Watery Essence. Do you have any recommendations for body sunscreen? Or sunscreen to wear to the beach/if you’re going to be in water or sweating? I’d really love to see your take on both. 🙂 I love your blog! Ooh, I might have to give this one a try when I run out next! I’m currently alternating between three – the Biore Watery Essence, Hada Labo UV Creamy Gel, and Kose Cosmeport Suncut Waterproof Essence in UV Protect Milk! Phew that was a mouthful, I had to go and get the bottle as there was no way I could remember that! The Watery Essence is my favourite of the three – love how easily it applies/absorbs and how it leaves a non-tacky finish. PS. You have got me addicted to cosdna!! Oh man, that Hada Labo Creamy Gel sounds good! I’ll be picking that one up soon! And the ingredients for that Kose sunscreen are really interesting! I’ve never heard of Ensulizole before. And the extracts are interesting ones too – I know you said it’s your least favorite, but I’m almost intrigued enough by the ingredients to pick it up anyway! The never ending sunscreen quest! I salute you on your journey sunblock soldier, I’m on the road beside you always frantically searching lol. Ahahahaha! I’m happy to have a companion on this journey. I know the perfect sunscreen is out there waiting for us. I kind of hope it’s packaged in a golden chalice. I don’t wear sunscreen as often as I should. >.> Guilty. Haha. They just so often feel oily on my skin. Thanks for the comprehensive review, though. Must get into the habit. Hi Kerry, I recently discovered your blog while searching for reviews on the Benton Snail Bee High Content Essence, and LOVE the details you put into every review..especially the detailed breakdown and explanation of the key ingredients. That is so informative and useful. 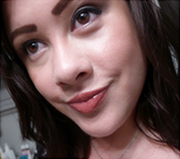 I also really appreciate your flash/interactive photos on cleansers to showcase their efficiency. That is so brilliant and I’m sure your effort is appreciated by many readers like myself. Thank you thank you thank you! Regarding sunscreens, I’m really surprise that you are not using the new, higher “PA++++” versions. Those has a much better PPD score and of course, superior UVA protection. I’ve switched over to PA++++ since last year and won’t even consider anything else any more. But then again…I’m a bit of a sunscreen nut. Looking forward to your next sunscreen review! By the way, do you have any BB or CC cream recommendations, or any color products, that offers good UVA protection and have at least a medium buildable coverage? Many thanks in advance! I just ordered four tubes of the biore sunscreen through your affiliate link on E-bay. Such a wonderful person! They offered to pay insured shipping and sent me such a lovely and correctly polite e-mail – the Japanese way, I guess. Thank-you for noting this seller, I will be sure to check their offering on a regular basis. The service was truly rewarding!